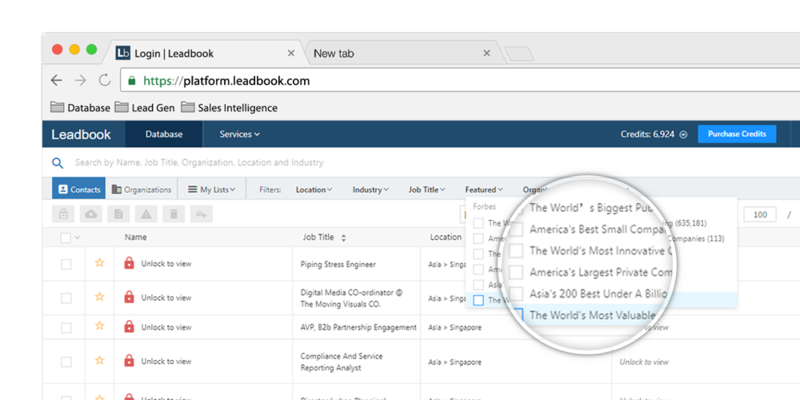 Build your target lists from a database of 20 million verified business decision makers. 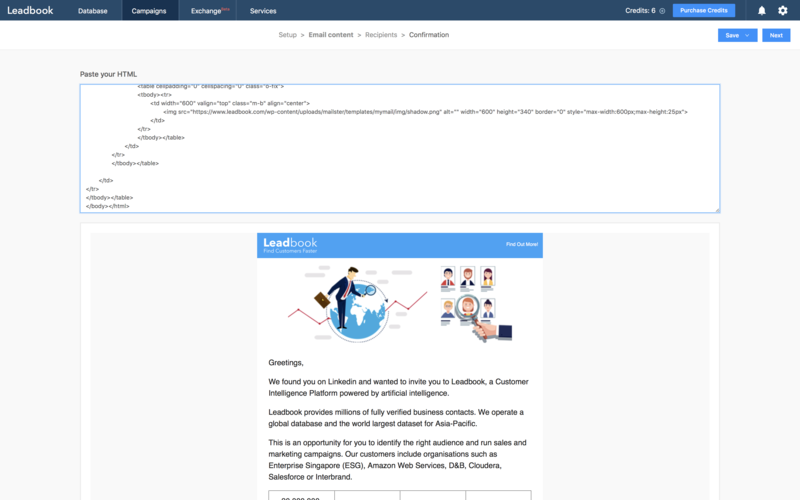 Send thousands of highly personalized emails to make meaningful connections. View contacts with proven interest in your products or services. Purchase business decision makers or contacts with proven interest in your products or services. 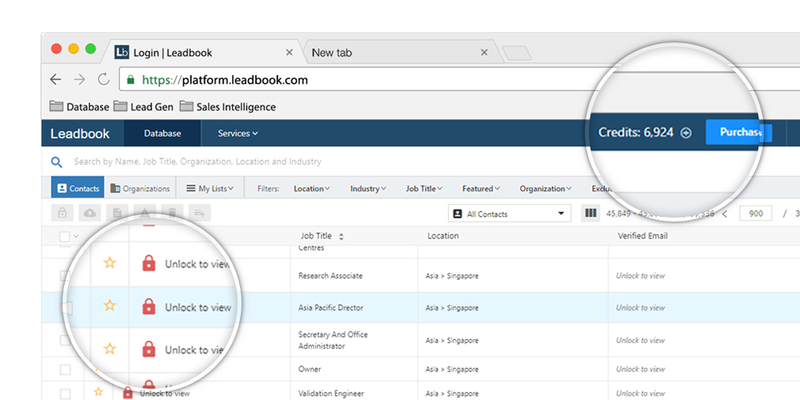 Enter keywords to search by name, location, job title, seniority, industry or organization size. Our intelligent search engine will return the most relevant results. You can do unlimited searches and preview the results in the main table. We operate a consumption model with a credit system that allows you to pick and choose only what you need. You can do unlimited searches and preview all profiles before you decide to spend your credits to unlock profiles. 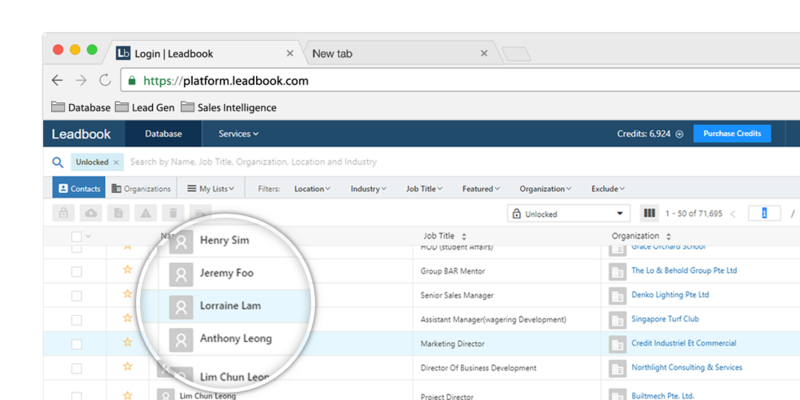 Create lists for each target groups or campaigns. Easily add or remove a profile from a list. Save for future use and export when needed. One-click to access to all contacts from the most sought after companies in the world. e.g. Forbes Global 2000, Fortune 500, Public Listed Companies, etc. View firmographic information for every organization and their list of employees. Create a Campaign by clicking ‘New Campaign’ and enter the required information like campaign name, subject and sender name to proceed further. Write the desired content for the campaign or paste your HTML template. Select the audience for the email campaign from your “My list” of targeted contacts. The outcome of the campaigns can be viewed on the basis of engagements or click-throughs. You can re-engage the best prospects to identify your potential new customers. 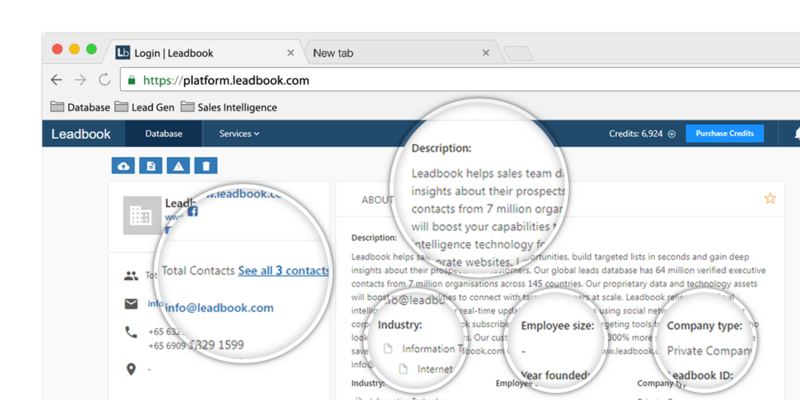 You can purchase the Click-Through Leads with your credits by unlocking their contact profiles. 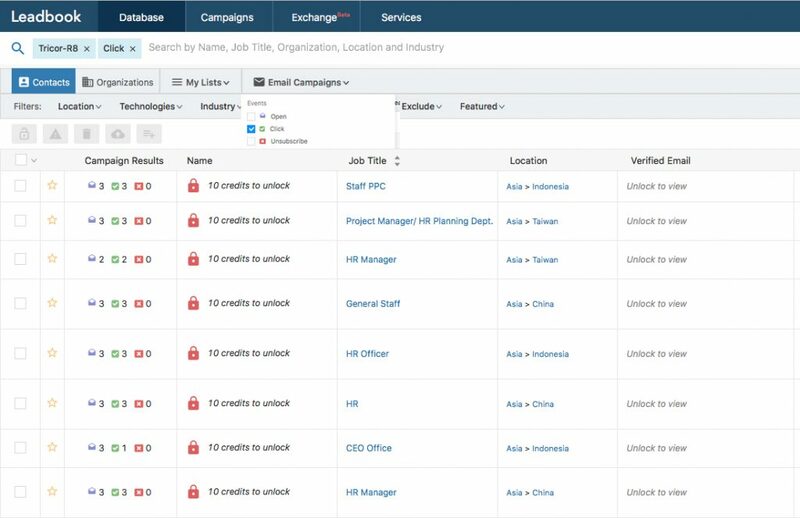 All users from your team can access the entire database worldwide and see what has been unlocked by another user. This means your team will never purchase the same data twice and will have no duplicates. We validate all contacts before adding them to the platform and we run quarterly verification cycles. However, if you find duplicates, you can report them to us and get credits back to unlock new profiles. 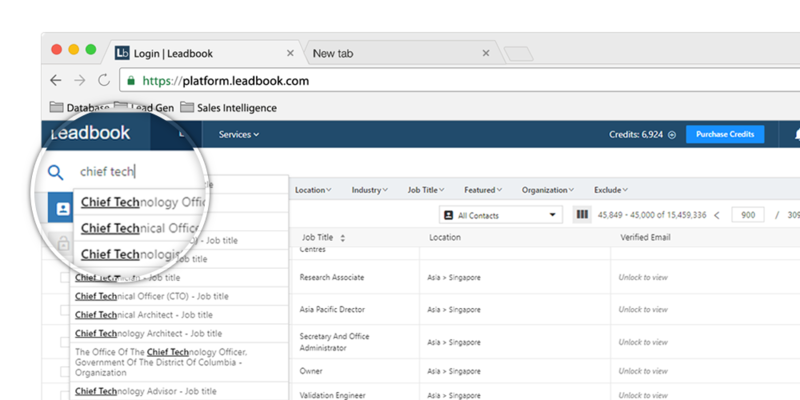 The profiles you acquire from Leadbook are maintained on the cloud platform and continuously updated with new verified information, at no additional cost. 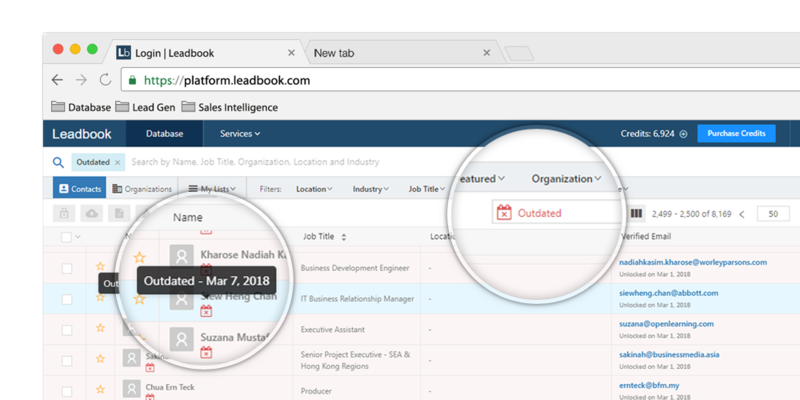 You will be notified automatically when contacts become outdated, for example when the contacts are no longer employed by the organization. 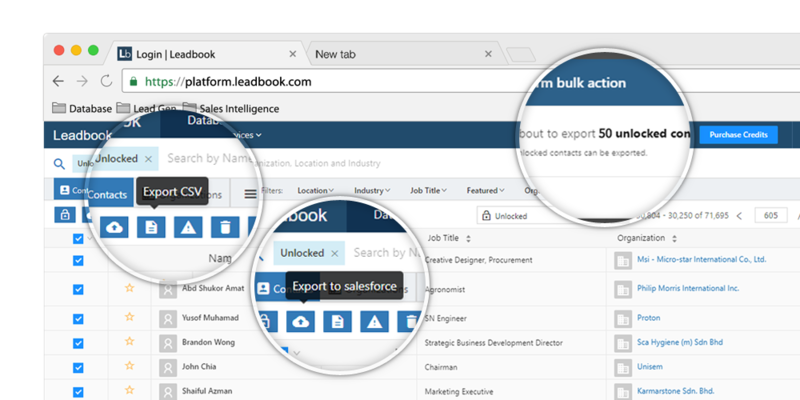 Unlimited export capability CSV, XLS and various CRM integrations; Salesforce, Pipedrive, Microsoft Dynamics and SugarCRM. Get free credits by linking your Google for business account or upload your contact lists. You earn 50 free credits the first time you link your Google for business account. You will also get additional free credits after we verify your business contacts. We are uniquely positioned to offer valuable data & analytic services to help sales & marketing teams accelerate growth; Additional & custom datasets, Data cleansing and enrichment,Building customer & buyer persona, Lead scoring and identifying “whitespace” accounts with similar attributes, Predicting cross-sell and up-sell opportunities from your existing accounts, Technology insights – find out which technology a company is using. 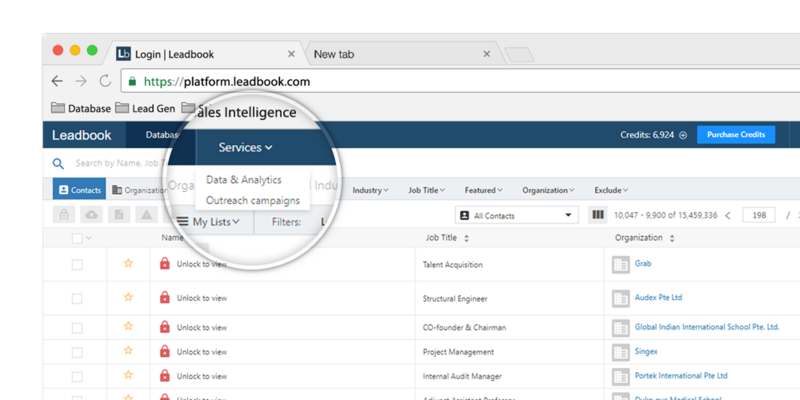 Build your email lists on the Leadbook Platform and contact us for the outbound campaigns. You do not have to purchase the data, you can rent it from us. We are uniquely positioned to help you reach targeted prospects with our sophisticated email automation engine; Lead generation, Invitations to events, Marketing communication opt-in campaigns, Increasing website traffic, Distribution of press-releases.